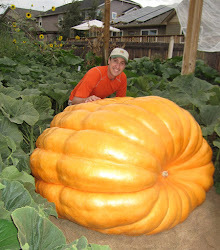 I have to admit I enjoy this rainy, cool weather this time of year but I fear for those growers who have big pumpkins growing. We've had 3 inches of rain in the last 24 hours and a day or two after this kind of rain you can find a lot of splits. Good luck to everyone whose pumpkins haven't split. I went out and covered all of the pumpkins with tarps, dried them as well as I could and emptied the bird bath on the 1421 pumpkin. I've added an extra cover for the 1421 to help keep that from happening. Even with a tarp that pumpkin had a half inch of water sitting in it. We had an inch of rain with high winds yesterday for about 20 minutes that had some hail in it. I also sprayed a 10% solution of bleach on the pumpkins. I was seeing a lot of oozing on the 1775 pumpkins in the rib cracks so I cleaned that out as good as I could and bleached them a little extra. I'll have to watch that pumpkin carefully but I think the standing water in the ribs is what was causing the oozing.